How to cook a prime rib in an electric roaster – easy and perfect every time. With the holidays upon us you may be planning out your Christmas dinner menu, like me. I traditionally make a ham with my family’s secret sauce, and this year is no exception. However I have discovered how to make the perfect prime rib in an electric roaster and have decided this decadent delight must be part of our meal this year too. Prime rib is my husband’s favorite meat so learning to make it well has been a goal for me; not to mention ruining a cut of meat the price is terrifying! 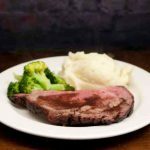 You can make a worry-free, perfect, prime rib in an electric roaster and everyone is going to love it! Now first things, first, I’m assuming you already own an electric roaster but if you don’t I can recommend the Oster 18 qt model (great for roast turkey too). You can probably do this recipe in the oven with similar results, but I have only done it in a roaster. You will also need a meat thermometer. It is important not to open your roaster during cooking so I recommend an electric meat thermometer like this one that can be read outside of the roaster. Make sure your thermometer has fresh batteries! Fear. Yeah, totally fear. No, really, that is why I originally did it this way. I felt like the roaster had more consistent temps that my old oven and with it self-basting I knew I couldn’t dry it out! I love using my electric roaster, especially for big holiday meals because it frees up space in my oven for other baking and side dishes. It was worth the investment and pantry space it takes up! Before we get to the recipe it most be noted that you should NEVER, ever, open the roaster during cooking. That’s why the meat thermometer is so essential; you’ll know it is done without lifting to look. A roaster self bastes the food but everything gets disturbed when the lid is lifted. Let everyone in the house no – NO LIFTING THE ROASTER LID!!! The same goes for your oven, if you choose to do it in there; do not peek until the meat thermometer says it’s done. The roast should take about 13 – 15 minutes per pound to cook, depending on how you like your meat. When you cook prime rib you can use these meat temperatures for guidance on how well done you want it. Most people associate prime rib with medium rare but not everyone likes it that way. You can set your meat thermometer to beep when your meat hits the desired temperature. Take the roasting rake out of the roaster and set aside. Plug your electric roaster in, lid on and pre-heat to 325 degrees F.
A lot of cooks will tell you to leave the roast on the counter for up to 2 hours to allow it to come to room temperature. I don't do that but it is up to you. Open your roast and place it on the roasting rack so you can just lift it into the roaster once it is prepared. We aren't going to be super precise with the seasonings - trust me, it is going to be ok! However you are going to get your hands all over uncooked meat so please take safety precautions to keep from doing any cross-contamination. Liberally salt the roast on all sides. Now evenly spread out the black pepper, rosemary and thyme over all sides of the roast. Really press those seasonings into the meat, including the salt. Next I like to spread the minced garlic on the top only but you can try to spread it around if you want. Carefully life the rack with the prime rib into the pre-heated electric roaster. You do not need to add any liquid to the pan. Put the meat thermometer dead center in the meat; and make sure it is on and set to your desired doneness. Replace the lid. Leave the roaster at 325 degrees F and DO NOT OPEN THE LID! Once done remove the prime rib from the electric roaster and allow it to rest for 15 - 20 mins. 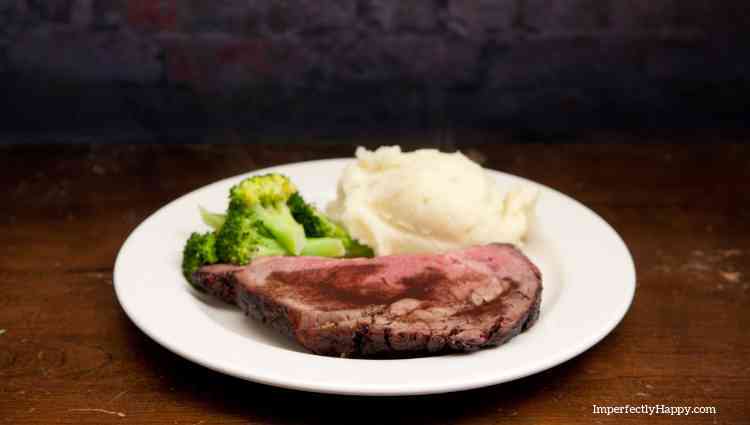 We like our prime rib with a creamy horseradish sauce that you can make in a jiff! If you find it too strong you can add a bit more sour cream until it is to your liking. In a small bowl whisk all your ingredients together and allow it to chill 20 - 30 minutes in the refrigerator. I hope you find cooking a prime rib in an electric roaster as easy as I do. Enjoy the rave reviews on this meal! Great served with mashed potatoes, and a simple green vegetable. Be sure to check out these other popular recipes!